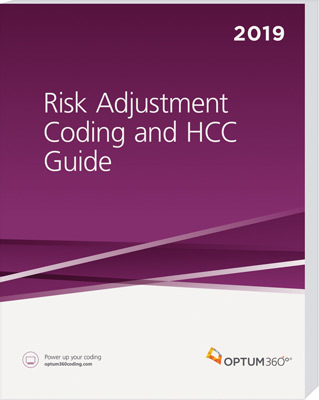 This new coding manual from Optum360 brings together hard-to-find information about risk adjustment (RA) coding and Hierarchical Condition Category (HCCs). The Risk Adjustment Coding and HCC Guide brings together hard-to-find information about risk adjustment (RA) coding and hierarchical condition categories (HCCs) in a new comprehensive resource that explains this complex reimbursement methodology. Now your organization will have a guide that provides both the “big picture” and the fine detail needed to document, code, and report essential information so that accurate risk levels are assigned and appropriate reimbursement received. Originally developed for use by Medicare Advantage (MA) plans, HCCs are now used in a variety of value-based reimbursement (VBR) programs. Our new guide helps you navigate the shift from a fee-for-service environment to VBR and provides the tools necessary to ensure risk levels and resources are aligned. Optum360 Edge — Understand risk adjustment coding and HCCs. Three types of HCCs covered under Medicare, CMS-HCC, Rx-HCC, and ESRD/PACE-HCC are explained. HSS-HCCs used for commercial plans and VBR programs are also explored. Optum360 Edge — Learn which demographic factors and conditions impact risk. Discover the role chronic conditions play in overall risk adjustment, how the risk adjustment factor (RAF) score is calculated, and how the cumulative RAF score for covered beneficiaries drives payments to health plans. Optum360 Edge — Understand the provider's role. Documentation and coding are the basis for delineating health status and calculating risk. Use the clinical documentation improvement tips to increase coding specificity which will translate into accurate RAF scores. Optum360 Edge — Calculate RAF scores. Use the HCC tables to identify conditions that impact health status and cost of care. Calculate RAF scores for your patients to quantify risk.